Ah, jet lag. How long can I keep using that as an excuse to sleep in past 10 am guilt-free? This is my third day in London in my new house and I’m ALMOST settled in. I’ve now got bedding, hangers, all the right plug adapters and a lamp. Unfortunately, I still don’t have the right light bulbs (it is a very confusing system over here, let me tell you), so I’ve been reliving my desert races by wearing my head torches around my room after the sun goes down. I figure it is good practice. I have still been feeling pretty sluggish on my runs lately and haven’t been able to get my alignment back on track since Vermont. I’ve been to the chiropractor a couple of times though, which has helped, and I’ll be back again today. Nothing like a good back crack and some needles shoved into my knotted muscles to set me straight, right? Anyhow, I set out for a run today to do some more exploring. I first did a loop around the Clapham Commons, which are about 50 m from my front door, and then headed towards Battersea Park. Going further North, I reached Hyde Park after about 45 minutes. I’ve decided Hyde Park is the Central Park of London. It was fantastic! There were people on horseback and those cute little policemen with the funny hats. 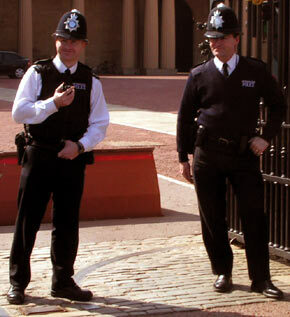 I think there is a height requirement in the UK that all policemen must be under 5’8″ — no disrespect to London’s finest, but I have yet to see any officer taller than me 😉 Just an observation…I’m sure the hats are intimidating enough to criminals. After about half an hour in the park I felt someone tap my shoulder. I turned around and couldn’t believe it – it was Andy Collier, one of the guys I chatted with before the start of the Vermont 100 and ran with for a few sections of the course!!! How random! Andy finished really well in Vermont (I think around 25th?) and is now training for the incredibly difficult Spartathlon race next month. I have the Spartathlon in my sights for 2010, but I definitely need more training for that one. It is 250 km straight through in Greece! Off for a deep tissue massage and back to the chiro. Then out this evening to see what London has to offer! More soon!